Sinking Feeling: What are the risks with coal mining subsidence? A new study has highlighted the extent of coal mining risk to residential and commercial properties and how they still exert a dangerous and hidden influence below our feet. Supporting the launch of the new Premium Plus CON29M Report from Future Climate Info, data partners Terrafirma have undertaken some compelling analysis which shows why conveyancers must continue to take mining searches seriously in affected areas. The infographic (above) shows that almost a third of buildings (29%) in the UK are underlain by coal mines. 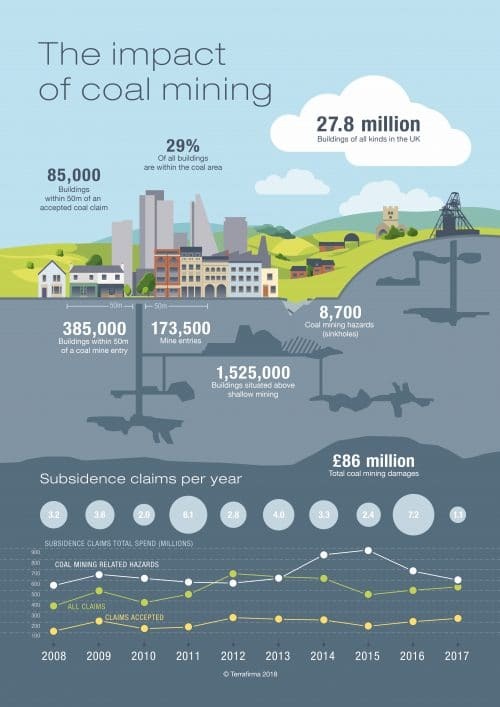 This has translated to approximately £40 million of damages paid out to properties in the last decade that have been affected by subsidence in these areas. And this pattern of subsidence varies wildly, with increasing attention being paid to the role of sinkholes from previously unrecorded mines. Coal mining has taken two forms – Deep and Shallow Mining. Much of the UK’s deep mining activity took place at the beginning of the last century and has, in general, been better regulated, recorded and remediated. This has resulted in a wide range of subsidence impacts after closure of the workings, as well as ongoing management of those mines affected by gas emissions and rising water. To the homeowner, while subsidence will affect their enjoyment of the home, the good news is that there should generally be little impact on insurance costs and excesses. The Coal Authority has an unlimited liability on remediating collapsed shafts and adits from coal mining, since it was created in 1994. In some parts of East Nottinghamshire, over 75% of the properties in a village have at least one subsidence claim on title. These are ongoing, with damage claims of over £9 million paid out to homeowners in 2016 and 2017. But the real culprit is shallow mining. The main problem is that most of these much older workings were unrecorded, in terms of their location, their depth and the angle at which they were worked. Because they were informal, they were easier to start, meaning that they are also prolific. Our data partner, Terrafirma, state that over 1.5 million properties are situated above recorded shallow mining works and a further 1.25 million buildings could be situated above suspected shallow mining. The first time anyone is likely to know they are there is when a sinkhole opens up. Every year, more than 500 of these coal mining sinkholes appear across the UK, from the valleys of South Wales to the suburbs of Newcastle and their impact can be devastating to home and business owners alike. Developers often neglected the potential for shallow mining to cause future ground movement and damage when properties were built, typically between the 1970s and 1990s. It is in these estates that mining-related sinkholes most often occur. But new builds today are also getting caught up in this hidden shallow mining legacy. In 2018, the Coal Authority will pay its largest ever damage claim out to homeowners on the Bayfield Estate in West Allotment, Newcastle. Families were originally evacuated in June 2016 and then permanently relocated in January 2017 after severe mining subsidence damage initially threatened five properties, later extending to a further 15 properties. In January 2017, five houses on the estate were demolished, with a further 10 scheduled for demolition, costing £95,000, with a total housing development loss of value of around £3 million. These shallow mine workings were not documented by The Coal Authority and the risks were not evident during preliminary due diligence when the land was originally purchased or later when the houses were constructed. Mine entries are vertical (shaft) or horizontal (adit) entrances to underground mines. They are numerous, poorly documented and often unreliably capped. There are some 172,000 recorded coal mine entries, but there could be the same or more that were unrecorded or badly filled. It is likely that this would cause a highly localised hole rather than widespread impact to foundations, but still represents a potential health and safety hazard in a garden or yard. More importantly though, it’s the public perception of a nearby mine entry that could have the biggest material effect – and this means the value to the property or the inability to sell it once purchased. An uncapped or unfilled mine entry recorded close or on the property could impact value by up to up to 30%. An uncapped/unfilled mine entry adjacent to a property could impact property value up to 20%. A capped/filled mine entry recorded within or under a property, may impact value up to 10%. A capped/filled mine entry recorded adjacent to a property, may impact value up to 5%. Will it affect your Client? To better understand these risks, a new breed of CON29M report, such as the Premium Plus CON29M available from Future Climate Info, now offers a clear, professional opinion for lenders, conveyancers and homeowners alike. It may be that the risk is minimal and the opinion can give all parties confidence. It may reveal hidden risk and an influence that you want to head off before exchange. Fully compliant and Law Society Approved, it is backed by Coal Authority data and interpretation of coal mining risk by Terrafirma and Environmental risk assessment from Future Climate Info – The Premium Plus CON29M is the definitive combined environmental and coal mining search for conveyancers.